You're tired of struggling with free traffic generation campaigns because you know that not only are they incredibly time consuming, they rarely pay off. You've sat by long enough, watching your competitors claim their share of traffic while your website is suffering from lack of exposure - and you're unable to make enough money to even justify the time you spent creating your products. So, you're interested in PPC marketing. You've heard just how incredibly powerful it can be, not to mention the fact that you'll be able to generate INSTANT TRAFFIC to your website without having to spend hours setting it all up. In fact, you can create a PPC campaign and pull the trigger, sending your message out to thousands - in a matter of a few minutes. But you're not quite ready for that yet. If you jump into PPC without knowing the in's & out's of the business, you could end up spending way more money than you need to and if your campaigns aren't carefully targeted, that money will be absolutely wasted. The truth is however, PPC has been made to be absolutely frightening to new marketers, and there's a reason for that. The big marketers in your niche rely on PPC to constantly flood their websites with unstoppable traffic and as you know, when it comes to online business - traffic = money. So they want to keep you away.. and the more frightening and risky they can make it seem, the less likely you'll even give it a try. But there's another side to PPC that you've been missing.. PPC doesn't have to be risky at all! In fact, you can spend less than $25 a day and get more traffic than your server can handle! You just need to know HOW to set up laser targeted campaigns that drive in 'qualified' buyers, so that every click counts for something. What would you do if you finally had the opportunity to launch your website deep into the heart of your niche market, without having to spend more than 10 minutes a day monitoring activity, tweaking campaigns and basically, keeping the momentum going? Imagine just how much more money you'd be able to make if you could flood your website with fresh, targeted traffic - and imagine how much more time you'd have if you could set it all up on complete auto pilot! 3 years ago, I was what you'd call a PPC "newbie". I had absolutely no idea what all the fuss was about regarding PPC marketing despite constantly hearing about how so many people were able to build absolute empires online just by promoting their businesses with this traffic-generating machine. When I finally decided to explore PPC marketing up close & personal, I realized just how much time and money I had lost simply because I let the opportunity slip by believing it was "too risky", or "too expensive". Not to mention, just like you - I was working harder than I really had to. Because of my budget, I was forced into taking a grass routes approach to marketing my online business. I didn't think I had the kind of money I needed to in order to promote my business with PPC Marketing. Boy, had I been misled! The truth is, you don't need a massive budget to exploit the power of PPC marketing. You can set whatever budget your comfortable with and work within that range and STILL be able to generate mass exposure for your online business. In fact, I don't recommend that anyone set a budget higher than $30 a day when just starting out with PPC marketing, because it's important that you first gain that vital experience setting up targeted, high converting PPC campaigns before you dive in head first. Then, once you've seen the power of PPC for yourself and you are comfortable spending more money (to make more money), you simply increase your daily budget and skyrocket your income! So, if you're willing to spend around $30 for an instant flood of targeted traffic (and buyers) to your website, you've got an equal chance to maximize your income while minimizing your workload. It's time we simplified PPC marketing, and removed the fear that's been holding you back. PPC marketing is the ONLY real way to get your marketing message into the heart of your niche market, without having to spend more than a few minutes setting it all up. You won't ever get that opportunity from a free marketing strategy like article marketing. Ever. (and you don't have time to waste writing countless articles in the hopes of being able to tap into just a segment of your market, either). It's time you made a powerful, bold move in ramping up your business and giving yourself the opportunity to discover just how incredible profitable PPC marketing really is! You deserve to know the truth about what PPC Marketing can do for your online business. 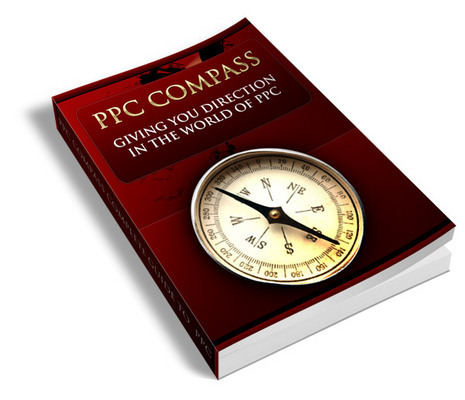 The "PPC Compass" was written to provide with you the direction you need to set up winning PPC campaigns quickly & easily and without risk. These are the proven strategies used by successful PPC marketers, and for the first time ever, you can take your business to the next level just by following along as I guide you every step of the way. Flood your website with red-hot, targeted traffic that will skyrocket your income, instantly - while setting your PPC campaigns on complete auto-pilot! PPC Compass will give you all of the information you need to develop winning campaigns, every time. * Nothing beats the power of a carefully written PPC ad, and I'll show you how to create high converting ad copy in less than 14 minutes! * The truth behind PPC marketing, and vital information that you need to know when creating your pay per click campaigns! * How you can saturate your advertisements across 2 powerful networks, while choosing where and when your ads appear for maximum exposure! * What a "quality score" is, and how you can increase yours - instantly lowering your advertising costs while gaining "enhanced" exposure absolutely free! * How to choose winning keywords for your PPC campaigns even if you have never conducted keyword research before! This is one of the easiest ways to find hot keywords, instantly! * How you can use 'negative match' to improve your CTR (click through rate), while making sure that only qualified leads click your ads!